The webbed extensions on my old Craftsman Contractors saw has always caught the edges of thin stock or laminate…..so I have added panels to both sides so my taper sleds slide between them. A wing nut and wood block hold them in place in the webbing. So I have now finished the fence for my crosscut sled. As you can see it gives me great flexibility with long, large, or small parts. I added a safety stop to the end of my outfeed table, to avoid the danger of leaning way over to see if the cut was finished. The stop is adjustable to the depth of the blade, and also stops the blade from cutting the fence in half. Since the sleds are square to the blade as well as square at the front end, I added a lip to the fence that butts against the sleds when they are pushed to the stop, so it auto squares. I very quickly double check with a square, tighten the track knobs, then insert bolts through the sleds from below to attach and tighten the handles….they are offset to the track knobs so they counteract any chance of twisting. I did the 5 step cut to check, and it was perfect. The stop blocks on the center part of the fence are slotted to force pressure on long stock like the 2×10 shown, which prevents the cut portion from flipping off the table. The other stops allow for longer cuts up to 24” as shown. The extension fence has a slot allowing a 48” cut. Measuring is a breeze as the tape fits into the blade slot. I have 37”x14” panels as well as rails and stiles for kitchen cabinets to make, so this sled will get a lot of use. Tapers are now safer as the cutoff stock doesn’t drop off the sled, and I can angle cut larger sheets with ease. I posted a video on Instagram of my new Adirondack Bar Chair prototype. The second video shows the taper jig in action on back slats and the long legs. 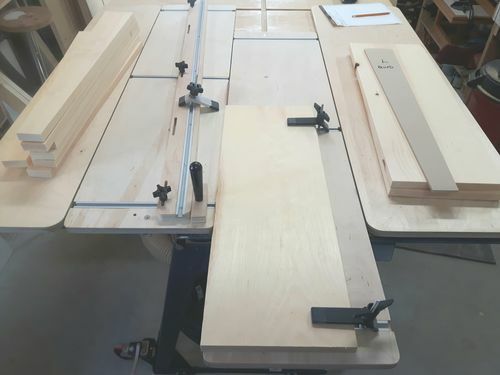 I have seen some pretty big crosscut sleds out there, and I haven’t got that kind of storage space for a large sled…..ALL of these parts quickly come off the saw and stack on each other under the new outfeed table that I keep in the parallel position now at all times. When all parts are cut, it also gives me an additional level assembly area. I will be posting the new chair soon, when I make the final parts this week. Thanks for looking. Even with a solid top a side platform keeps the offcuts up, and allows for a smoother parting of pieces, no more “hanging chad” at that very last piece hanging on tries to part off, but often breaks. It’s why a sled can offer such clean cuts, and also why Rockler sells their little sled with an offcut board available. It’s great when a jig, or fixture makes your work better, while offering a much higher degree of safety. Win win. Thanks Steve. This complete package has been a game changer in my little shop. The time I have spent in the last 2 months making jigs for each tool has made a huge difference in safety as well as accuracy and productivity. That is really nice. Great engineering.